National early childhood research shows that when children enter kindergarten behind their peers, very few are able to "catch up," and even fewer will excel. The children that struggle often require expensive intervention later in their academic career and in life. Minnesota kindergarten assessments support this research and show that 50 percent of Minnesota children are entering kindergarten unprepared for school success. To connect national efforts with local communities in west central Minnesota, community teams come together once a year to learn more about what they can do to better prepare young children for kindergarten and beyond. These PreK-3rd alignment teams consist of school administration, teachers, child care providers, civic leaders, parents and other community members. The forum has included a national speaker, local success stories and time for teams to integrate new information into their current plans. Learn how educators in three school districts--Henning, Morris and Pelican Rapids--are working to align curriculum so what kids learn in preschool are the building blocks to success in each subsequent grades. 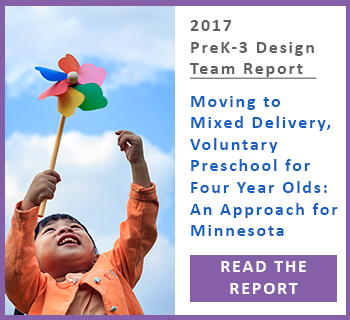 The Minnesota PreK-3 Design Team, convened by West Central Initiative and The McKnight Foundation, worked to develop recommendations on what a voluntary, statewide, mixed-delivery preschool approach could look like in Minnesota.